A fiber craft that was popular during the civil war period but which has become less popular today is tatting. For the complete story of tatting, check out the book Flitting Fingers in the Modern Books section. That book contains the history of tatting as well as a sampling of patterns. That book also contains a chapter devoted to needle tatting and discusses the appropriateness of that technique to civil war living history. The kit contains a book of instructions, a shuttle, and a hank of thread. While the shuttle is plastic and has a point at the end -- neither feature being period, especially the plastic -- the kit provides the materials to learn tatting and make pieces of tatting. 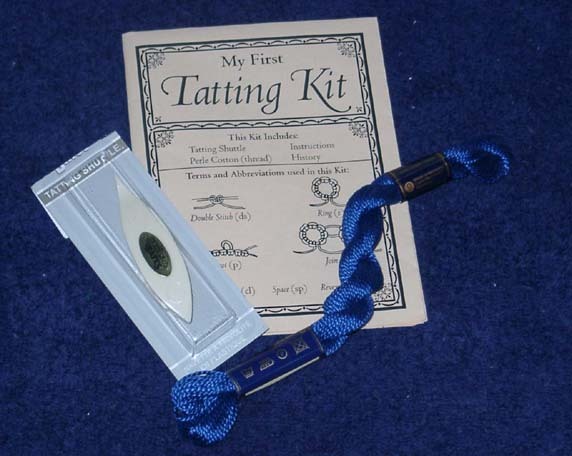 After learning the techniques, if the tatter wants to demonstrate tatting at a living history event, he or she can obtain a period-correct shuttle (19th century shuttles are also discussed in Flitting Fingers).